At McQueenie Mulholland we know that many charities, particularly small and local organisations, can find it hard to stand out on social media. Crowdspeaking tools can help you to cut through the noise and deliver your message more effectively. You’ve probably heard of crowdfunding, which is a way of raising funds by asking a large number of people for small amounts of money. Crowdspeaking works in a similar way, but instead of asking for money you can ask people to share your message on social media. Rather than having your message shared ad hoc in a way that can easily get lost, crowdspeaking tools allow you to share your message across all of your supporters’ social media accounts at a date and time that you choose. Similar to fundraising goals on crowdfunding platforms, crowdspeaking tools like Thunderclap ask you to set a supporter goal. When you reach this goal your message will be published on your supporter’s social media accounts at the time you have designated when setting up the campaign. If you don’t reach the goal then the message will not be sent out. You need a short, powerful and engaging message with a clear call to action. Think about what you want people to do when they see your message and make sure there is a link to a URL where they can take that action, whether it is signing a petition, attending an event, or donating money. 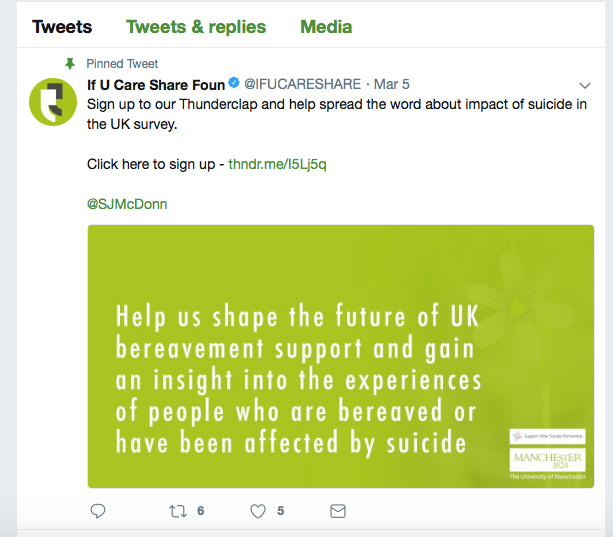 This campaign, lead by If U Care Share Foundation, has a clear objective (influence suicide bereavement support) and a simple call to action (complete the survey). The link clicks straight through to information on how to take part in the research. To maximize your impact, do some research to work out when your target audience is most active on social media and choose the best time to publish your message across your supporters’ accounts. Twitter Analytics and Facebook Insights can help with this. Just like a crowdfunding campaign, you need to engage with existing and potential supporters to get them to sign up and commit to sharing your message. Before you launch your campaign, make sure you’re prepared and have a plan to get the word out. Not everyone has a social media account, and not all social media users will be familiar with crowdspeaking so engagement rates may be lower than more traditional, familiar methods such as email campaigns. However, that doesn’t mean it isn’t a great tool. Crowdspeaking can make a real difference to getting your message across effectively, and will work best as one part of a wider, multi-channel communications campaign. Thunderclap is the leading crowdspeaking platform. Take a look at some of the most successful campaigns and contact us today to discuss how crowdspeaking could support your communications strategy.